The hardest working singer in rock music, Myles Kennedy, just released the latest music video for the song “The Great Beyond” from his debut solo album Year Of The Tiger. The new video comes on the heels of wrapping a US tour run with SLASH and THE CONSPIRATORS on the success of their latest single “Driving Rain”. The video is shot in black and white and features performance footage of the song from various stops on Myles’ sold-out summer tour of Europe, a tour that saw him perform the material live for the first time with his backing band from the album: Tim Tournier on bass and Zia Uddin on drums and percussion. You can watch the video for “The Great Beyond” on KNAC.COM HERE and Year Of The Tiger is available now wherever music is sold or by clicking HERE. Myles Kennedy, not one to spend a lot of time at home, is heading back out on tour of the United States in support of his debut solo album Year Of The Tiger, courtesy of Napalm Records. The 18-date US tour will kick-off on November 13th in Chicago, IL and run through December 16th where it wraps up in Seattle, WA. Along the way, the tour will make stops in Milwaukee, WI; Cleveland, OH; Hartford, CT and Atlanta, GA among others. The performances will feature music from the critically acclaimed solo album as well as selections from Myles’ work with ALTER BRIDGE, THE MAYFIELD FOUR and SLASH FEATURING MYLES KENNEDY AND THE CONSPIRATORS. WALKING PAPERS will be openers on all of the dates as well. All shows are currently on-sale and all tour information including ticket links and VIP information for all dates can be found at www.MylesKennedy.com. 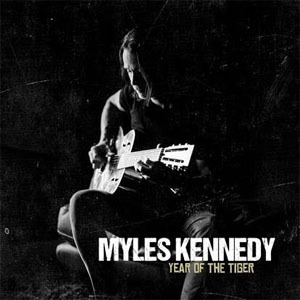 On the Year Of The Tiger album, Myles embarked on his first venture as a solo artist by embracing musical elements and influences he hadn’t explored previously in his career. Kennedy himself played banjo, lap steel, bass, and mandolin in addition to guitar throughout the album. The emotional journey and personal story of Myles is captured in a bluesy-americana album with a twist of country and rock, swirling and flowing around the incredible, soulful voice that the world has come to know.